What to do? You have more Thanksgiving leftovers than you know what to do with, and holiday visits from family and “friends” you only see once a year has De Leon-blocked you for days. Solution: make a leftover turkey torta. Granted, this might not be what one would call authentic, but it’s a quick, easy, and tasty snack, and a bit different from your standard leftover fare. This is as simple as it gets: Set a pan over low-medium heat, and toss some thinly sliced turkey in it (amount depending on how many sandwiches, etc.) with a bit of salsa. Toss it around until it starts heating up, and the mixture take on a chunky consistency. Meanwhile, warm up the beans. 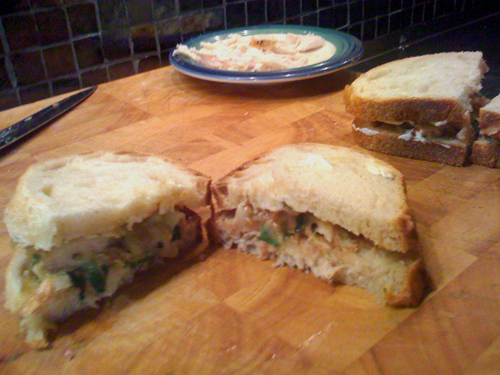 Smear beans on bread (which you can toast beforehand or heat in the pan after assembly), and layer the parsley, turkey mixture, and cheese on top of it. Spread some sour cream on a second slice, and bump the two pieces of bread together. Voila. Instant American/Mexican/French/Italian/whatever style leftover sandwich! Of course, all the ingredients can be substituted, seeing that this is all, y’know… Leftovers. Do you recommend Leftover turkey torta? Make your voice heard!